Our house is a traditional, beautiful big "Swiss Chalet". We offer 5 bedrooms, one with two beds, all the others with single bed. If needed, there is enough space for two persons/each bedroom (mattress available). A baby bed can be organised. There is one large living-dining-room. In addition, there is an additional possibility to eat on the balcony and in the gardenhouse. Fully equipped kitchen available. The fireplace (including fully equipped barbecue) is in the garden house. From the balconies (first and second floor) we overlook the small village of Niederscherli (part of Koeniz) and the surrounding mountains. A big trampolin is installed in the garden. Niederscherli (part of Koniz) is situated 10 km southwest of Bern (capital of Switzerland, city of UNECSCO heritage). The house is in a very quiet part of the village sourrounded by woods, farms (sheeps, goats, alpaka) and the village (shopping possibilities). The train station (local train to Bern) is at walking distance (5 min). The local train takes 18 minutes to the Swiss capital (every 30 min. until midnight). 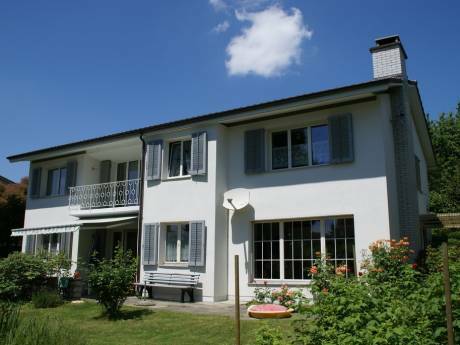 Ideally located as touring base, the house offers easy access to the famous tourist destination in the alpes (max. 60 min. to Interlaken, Grindelwald), to the lakes (ca. 30 min. by car to the Murten- Neuenburg- Biel- and Thunersee with all leisure possibilities) to the rivers (ca. 10 min. by car to Sense or Schwarzwasser, and 20 min. by car to swim in the Aare in and outside of Bern). Using the intercity trains from Bern you can travel to the main cities of Swizerland (Zurich, Basel, Lausanne) within 1 hour (similar by car). 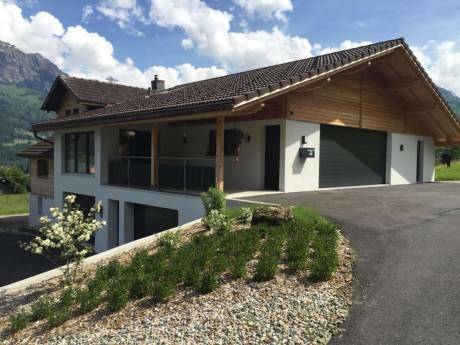 Taken together, the house and its location offers multiple possibilities for families with children at any age to get a glimpse of the different countrysides and cities of Switzerland.